I’m not sure exactly when I first fell in love with fairy gardens, but I’ve always loved miniatures. 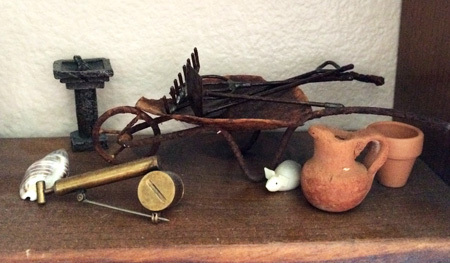 I have been collecting little things that catch my eye for years. I love the fact that I can blend two of my favorite hobbies and come up with something so fun even the grandchildren can’t resist playing along. 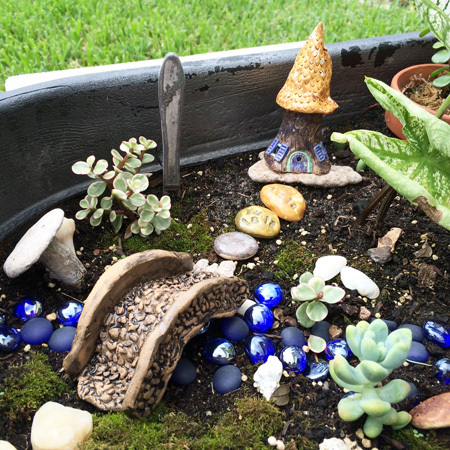 One of the first things for starting a fairy garden is the foundation–the container. You can use just about anything. Small containers are great to get started because they don’t really need much decoration. If you have a lot of fairy garden accessories already it may be wise to choose a larger container. I have seen everything from an old cooking pot to a bathtub! Use your imagination and look around at what you already have. Do you have an old colander that isn’t being useful in the kitchen? Do you have some elegant flower pots that would add some charm to your garden? Even a simple clay flower pot is a good beginning. Be sure that the character of the pot will match the look and theme of your accessories and plants. Next you will need some plants that will fit into a miniature scheme. Look for plants with smaller leaves. 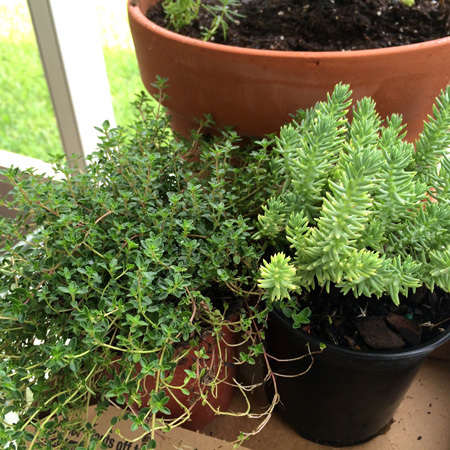 Small evergreens are often found in garden centers, produce sections of grocery stores, and in flower shops. Herbs make great fairy garden “trees”. Rosemary and Thyme have woody stalks that can be trimmed to look like trees, plus you get to enjoy the herbs in your cooking and the wonderful scents of the plants. Small scale succulents also make nice plants. Keep your eyes open. You will be surprised at how you look at plants differently when you gear your thinking to a miniature scale. I have a tiny bougainvillaea that is only about eight inches tall. 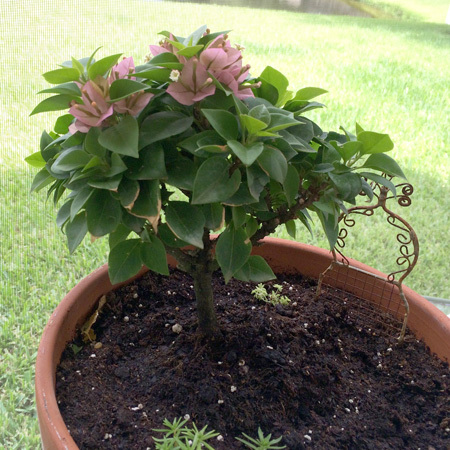 It is in a medium sized flower pot and is trimmed to look like a “tree”. Another important addition to your garden are foundational things like rocks, stepping stones, or marbles. Glass marbles make adorable little “water” features and rivers. Tiny stone walkways help to make your garden into an artistic composition by drawing the viewers eye into the scene. I have used aquarium gravel for this purpose and the scale of the stones look great. I shoot for more natural colors, but that is just my preference. Bright colors may be more fun and magical if you are creating gardens with children. Now you can add the details. Small fairy houses, benches, fences, tiny potted plastic plants, wheel barrows, and more. There are more and more suppliers catering to fairy garden enthusiasts every day. Check Pinterest and Etsy for ideas and resources. Please take a quick visit to my etsy shop and see some of the items I have as well. Finally, it is really important to keep things simple. If you have a plethora of fairy garden accessories, avoid the temptation to put them all into one garden. It is better to have a few things that go well together than to clutter a beautiful little garden with to much stuff. 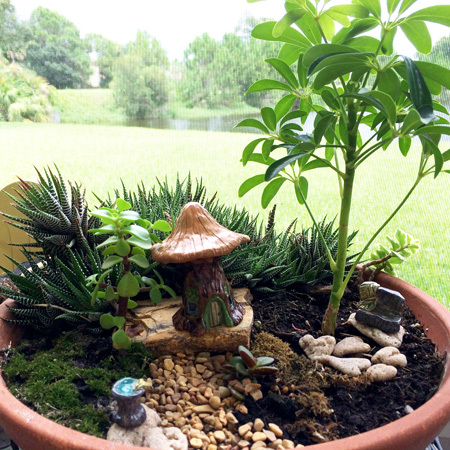 I have several fairy gardens, miniature gardens, and a few bonsai at my house. I try to only add a few little decorations to each. It is fun to have some items “hidden” under a plant or at the edge of a walkway. Let me know what you think! I would love to feature your garden on my blog. Please contact me at dwaldorfjohnson@gmail.com if you are interested.